Third Order Effects, LLC (3OE) is the premier choice for filling Governance and Cultural Advising roles and is uniquely qualified to provide strategic advising and consulting in areas of unrest. 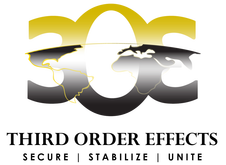 3OE’s foundation is to provide expertise in securing sound governance and stabilizing areas of unrest to provide a safe and secure environment; by uniting the people and communities and the infrastructure developed to support them. Just as our name suggests, our objective is to assist our clients so they are not only able to identify the immediate problem, but put in place the viable solutions that will establish long lasting results.